Artist’s book collection/exhibition, by Ulla West commissioned artist to programme Vita kuben, space for art at Norrlandsoperan in collaboration with producer and artistic leader at Norrlandsoperan, Tina Eriksson Fredriksson. The travelling artist’s books library was the startingpoint for MABL, Mobile Artist’s Books Library. Vita kuben Norrlandsoperan in Umeå. The first presentation of a travelling artist’s books library took place during 2010 when I was appointed as quest curator of the White Cube at Norrlandsoperan in Umeå. Apart from my own presentation I invited two artist’s, Lina Selander and Reena Spaulings/ Bernadette Corporation alias Emily Sundblad to use and work with the white-cube-limits while presenting artworks and installations parallel to presenting their different ways to use the white pages shaped and put togehter as books. My aim was to present different artistic approaches to the white cube fenomenon, aswell as these specific artist’s bookworks and in a wider spectra: different kinds of artist’s books, such as printed matters from big editing companies aswell as limited crafted editions or as unique artworks/objects and experiments with new techologhy. Outside the artspace Vita kuben a small library was built up. During the period of three exhibitions the library grew bigger. 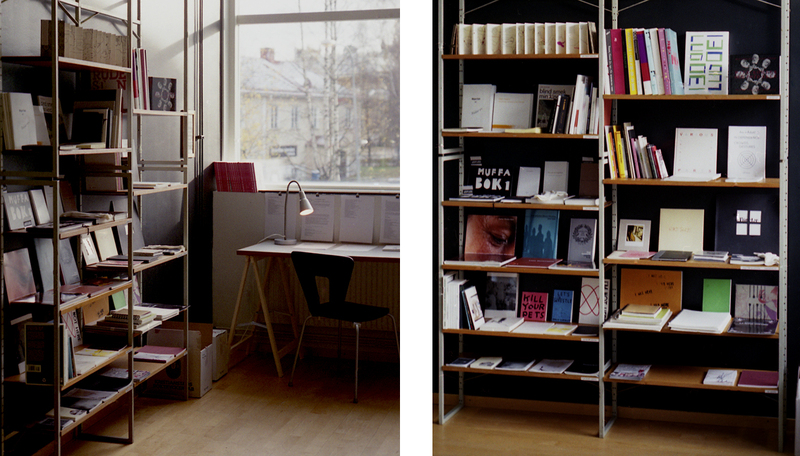 Students from University College of Arts in Umeå was invited to present artist’s books in this temporary library. For the opening the poet Mara Lee made a commissioned textpiece to be performed live. The performance took place at University College of Fine Arts. Dahlberg, Kajsa, A room of Ones Own, a thousand libraries. a space for visual art at NorrlandsOperan, programmed by artists. Vita kuben started in 2002 as a public space for intermedia arts, for sound, video, performance, etc. 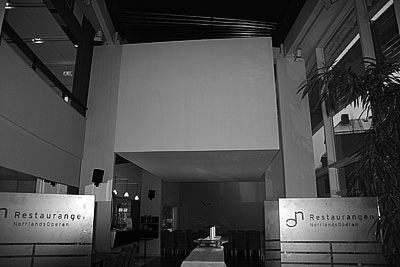 A space for artistic expressions of temporary and searching character. Situated in the public heart at NorrlandsOperan in Umeå it offers new encounters between audiences and also makes contemporary art accessible to a wider public. With Vita kuben the visual arts field has become a natural and powerful component at NorrlandsOperan. Together with the MADE-festival it creates a new arena and melting pot for new artistic expressions. Since it started Vita kuben has been programmed by independent artists, invited on yearly or half year basis. Free and independent artists are given the chance to curate a programme that bears it’s own theme or context. This way Vita kuben has always had a varied and unexpected programme that also reflects the actual artist in new ways. Over the years Vita kuben has hosted artists of national and international reputation as well as artists from the region. At times their work have created headlines and contributed to both local and national discussions concerning artistic development, powers and possibilities. Discussions that constitute the foundation of a vital activity in Vita kuben! Tina Eriksson Fredriksson initiated and created the accompanying strategies and statutes for Vita kuben in 2002. She was part of the steering group until she became head of department in 2006, at the same time becoming artistic director for the MADE festival. In 2010 Tina EF invited Ulla West to curate a programme for Vita kuben. Ulla W created a programme as well as an ongoing artist’s book library in the opera house foyer. This was the first time we both collaborated and seed for MABL was planted. Below follows Ullas program as well as a list of the programs that were curated during the years that Tina ran Vita kuben. Theme for this autumn is storytelling in artistbooks, starting with a groupshow presenting a number of different books and works. It may be unique solitary bookpieces, handmade limited editions, books edited on private basis or artistbooks from small publishers. Some of the artists also present works in other media related to books. During November and December two artists are invited, both of them working with storytelling in different media, one based in New York and the other based in Stockholm. October is an overview and November-December focus on two specific artists.Lina Selander and Emily Sundblad alias Reena Spaulings alias Bernadette Corporation.